My interest in lectures has meant that I am a bit behind with catching up with the music available online. There is so much of it nowadays, don’t you think? Can anyone possibly keep up with it all? I am rather overwhelmed! My music listening experience has also changed because of this. There was a time when I had only a very limited number of tapes and then CDs. I listened to them so often that I would be pre-empting every note, every pause in my mind as I listened. Nowadays I am always listening to something new. Exciting but also a bit sad…I miss the familiarity and sense of homecoming I felt with my favourites. As I was playing catch-up on YouTube last week, I came upon this excellent concert by Ranjani and Gayatri from which I have chosen a song to present to you today. 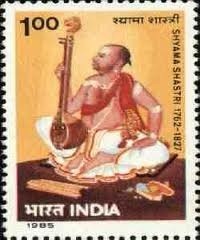 Shankari Shankuru is composed in Raga Saveri by Shyama Shastri. Like many songs of this genre, it is a simple prayer followed by many phrases to identify, describe and praise the Goddess. As we listen, the phrases invoke physical imagery (e.g. slender-waisted Goddess). We are reminded of stories by some phrases (e.g. remembering how Manmatha became an enemy of Shiva) and are reassured of the grace of the Goddess by other phrases (e.g. 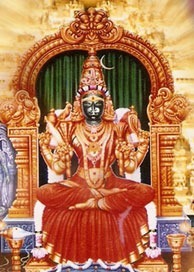 she gives reward to her devotees). Though I choose to concentrate on lyrics in this blog, renditions such as the one I have chosen are more about the raga and creativity than about the lyrics. In this piece by Ranjani and Gayatri, the total time of 31 minutes is composed of 26 minutes of improvisation and only 10 minutes of composed music. The improvisation is in the form of Raga Alapana (slow melodic improvisation without rhythm 0-13:50) by the vocalists and the violinist. Neraval (melodic improvisation of a single phrase from the song within a set rhythm 17:31-25:15 ) and Kalpana Swarams (melodic improvisation using the Indian solfege within a set rhythm) to 30:27. So of a total of 31.28 minutes, more than 26 minutes is the creative component. The composed content is just over 5 minutes. So as much as I go on about words, meanings, inferences and associations, this music is more about creativity and setting the mood. Saveri is a raga which sounds like supplication, even if no word is uttered. How beautiful are the phrases created by these two extraordinary sisters! I must especially mention the young violinist Vittal Rangan who demonstrates truly impressive skills! And those who have fallen in love with Saveri and would like to listen to another excellent rendition, here is R.Vedavalli doing an exceptional job of it. note – only third charanam is sung in concerts normally. Also though the long ‘I’ at the end of some words is shortened in songs, I have chosen to use the correct spelling in Sanskrit. O Consort of Shankara/Shiva (shankarI)! Please create (kuru, literally do) tranquility (sham)! O Moon faced one (chandramukhI)! O Goddess (IshvarI) of the whole universe (akhilANDa) ! O ShambhavI (name of Parvati)! One worshipped (vanditE) by Brahma, the one born (bhava) in a lotus (sarasija)! O Mother (amba) Gauri (name of Parvati)! One who removes/destroys (hAriNI) danger/crises (sangkaTa)! One who crushes (vidAriNI) enemies (ripu)! O Auspicious one (kalyANI)! One who gives (dAyikE) reward (phala) to those who always (sadA) bow to her (nata). O Consort (nayikE) of Shiva (hara)! O Mother (jananI) of the world (jagat)! One who sports (vilAsinI) with Shiva (jambupati, from Jambukeshwara Temple of Tiruvanaikaval, where the Goddess is called Akhilandeshwari. This is one of the Pancha Bhoota Sthalams, representing water). One who takes joy (ullAsinI) in protecting (avana) the world (jagat)! One whose neck (kandhara) is like a conch (kambu)! O Bhavani (name of Parvati)! One who carries (dhAriNI) a skull (kapAla)! One who weilds a spear (shUlinI)! One who pleases (tOshiNI) the enemy (ripu) of the God of Love (angaja)! One who nourishes (poshinI) the entire (akhila) world (bhuvana)! One who provides (pradE) good fortune/welfare/happiness (mangala)! O Consort of Shiva (mRda is a name of Shiva)! One who walks (gamanI) like (samnibha) a swan (marAla)! O Sister (sOdarI) of the dark skinned Krishna (shyAma kRshNa) (also signature of the composer)! O Shyamala (name of Parvati)! One with a slender (shAta) belly/waist (udarI)! One who takes pleasure in (lOlE) the chanting (gAna) of Sama Veda! O Young one (bAlE)! One whose nature (shIla) is to always (sadA) dispel (bhanjana) grief (Arti)! Happy Navaratri, Dussera and Durga Puja to all my readers! I hope you are all enjoying the festivities of this season! I feel very blessed by the Goddesses this week; we’ve had some very good news in the family. My son has just been accepted into the College of Psychiatry, a dream he has had for a long time. For those who haven’t read my occasional forays into personal life, my son (25) is a doctor currently working as a Resident. He has long dreamed of becoming a Psychiatrist. His getting a placement as a Psych Registrar is a very big step in the many steps that it has taken to embark on his chosen career. It feels especially good to get this news during Navaratri. We believers think that our Gods and Goddesses are omnipresent. That they are present both in those who acknowledge them and those who don’t. Let us search for Shakti first. She is manifest as energy all around us. Touch your skin – even the warmth there is but a manifestation of the energy your cells create. But just as in a temple we need to perform a prANa pratishTHa to consecrate the idol and bring the power of the deity within it, we too need to ‘consecrate’ ourselves to let her manifest her powers within us. How can we do that? I have a theory..
Is Shakti not energy? So if we follow our goals with energy and vigour, surely it is a celebration of her! Shakti is prANa, the life energy itself. How better to worship her than by looking after the health of our bodies and minds? Shakti is courage. By developing our self-confidence and courage, we invite Her to take residence in our hearts. As a baby my son was afraid of the whole world. I could not even enter a lift if there were others there! It took years of coaxing for him to accept the world outside our family. As a boy, he was shy and retiring. He would hardly meet anyone’s eyes when he talked. I remember a moment of pride when at sixteen he voluntarily walked up to a visitor at home and introduced himself; it felt as if he had crossed an important threshold! When he bravely presented a research paper at a Psych conference at 21, almost a decade younger than the next youngest conference attendee, I was bursting with pride. I have seen him slowly build on his courage, his self-confidence to a level that he performs very well in interviews. If this is not the prANa pratishTHa of Shakti, what is? Lakshmi too is ever present in our lives. Every time anything good has happened to you, every time you have felt lucky, every time you have enjoyed a sense of well-being and happiness, it is but Lakshmi kaTAksham – Her eye has fallen on you. Or so I believe. She may look in our direction but unless we have done the groundwork to receive it, her blessings may slip and fall from our fingers! In his last rotation, my son was lucky enough to have the Head of Psych Training of another leading hospital as his supervisor. That was Lakshmi kaTAksham. She gave a glowing reference saying that ‘I’ll be happy to work with him as my colleague’! By working hard and well enough to gain such a reference, he prepared himself to receive Lakshmi’s blessings; I see it as Lakshmi pratishTHa. At another conference he attended, he learnt that one of the interview panellists was there. That was Lakshmi kaTAksham. He walked up to him and introduced himself, talking of the job he hoped to get. That is Lakshmi pratishTHa. A senior nurse he worked with happened purely by chance to meet one of the panellists. She remembered my son voluntarily and spoke well of him. That was Lakshmi kaTAksham. That he had established a good relationship with the nursing staff, that is Lakshmi pratishTHA. Where would we be without Saraswati? Knowledge governs our life at every turn. An infant who recognizes his mother as his source of nourishment and succour, even that infant has an important piece of knowledge. We are bombarded with information in this world, we absorb only a minute fraction of which even a smaller fraction gets converted into knowledge. As to wisdom, I don’t know how one gets that but I hope that one day our knowledge leads us to wisdom! Is not Saraswati in all sources of knowledge, in all wisdom? When we convert information to knowledge and then into wisdom, what is it but Saraswati pratishTHa? Even with his limited income as an intern and a resident, my son made the effort to attend many seminars and conferences in Psychiatry over the past two years. I myself was surprised when I saw his CV – ‘When did he get the time to do all that?’ I wondered. When we pursue knowledge we are but paying homage to the Goddess! I have rambled on a bit, haven’t I? But then a proud mama is allowed to gloat a while! But back now to music. My song choice today is a composition by Shyama Shastri in the Raga Varali. ‘Please protect me’ says the composer, invoking the many qualities and symbolisms of the Goddess. He was a priest at the Kamakshi temple in Tanjavur; his love for his Goddess is very evident in this composition. I present below this beautiful song in the mellifluous voice of Bombay Jayashri. Note : I do not speak Telugu; I have sourced the translation from multiple web sources. O Kamakshi! O Golden (bangAru) Kamakshi! Please protect (brOvavE) me (nannu). Why (Ela) delay (tAmasam)? Please come (rAvE)! O Enjoyer (lOlE) of recitation (gAna) of sAma vEda! O Virtuous One (sushIlE)! O One who protects (paripAlinI) shyAma kRshNa (signature of composer)! O dark-skinned One (shyAmaLE) who holds a parrot (shuka)! O Consort of Shiva (shiva shankarI)! O One who holds a trident (shUlinI)! O Queen Consort (rANI) of shivA (shivuniki)! O Large-eyed One (visAlAkshi)! O youthful One (taruNI)! O One who is manifest (rUpiNI) eternally (shAshvata) ! O Goddess (dEvI)! Please listen (vinu) to my (nA) plea (manavini). I trust(namminAnu) you alone (nIvE) to be (ani) my refuge (gati)!! O my (mA) mother (ammA)! Quickly (vEgamE) show (jUDu) mercy (karuNa) O Mother (ammA)! O Golden (bangAru) Idol (bommA)! ‘You are what you are eat’ , so say the wise ones. The tradition of watching what you eat is an old one in India. According to Ayurveda, our bodies have vata, kapha or pitta doshas, or a combination thereof. For good health, we should eat that which stablizes the imbalance between the three doshas in our body. This has been a proven health system, surviving for centuries in India. What about the makeup of our minds? Our minds are a combination of sattvik, rajasik and tamasik gunas, says Ayurveda. The gunas associated with what we eat affect our mind. For good mental health and well being, we need to ingest lots of sattvik food, less of rajasik food and avoid tamasik food. But I ask, why consider only the food we eat? True, the body ingests only food. But does not the mind ingest so much more? What we see, what we read, what we hear – they all form food for the mind, do they not? Should we not watch out what we ingest mentally as well as physically? It amazes me that the young ones, even those who are careful about their health, listen frequently to loud, throbbing music with lyrics which are often very passionate. The films they watch are much of the same, with added violence. Will these types of ‘ingestion’ not lead to future generations of people who are strongly rajasik or tamasik? Where are they getting their daily does of sattvik food for the mind? I assure you that I am not deaf to the talent and music which exist outside the Carnatic world. I am known to hum along with Bollywood songs, not just the classically based ones, but even foot-tapping ones such as Piya tu ab to aajaa from olden times to even Kajra Re, Munni Badnam Hui and Sheela Ki Jawani! There, I have shocked you, I know! I admire the talent of the singers and the music directors who have created songs which find such mass appeal. I am not deaf even to Beyoncé gyrating to Put a ring on it or Shakira declaring that Hips don’t lie (wow! ); they are both such incredible singers and dancers! So yes, there is interesting music everywhere but is it sattvik music? Far from it! Carnatic Music is on the whole sattvik, but some compositions epitomize that. So today, my music has been selected to balance all the rajasik and tamasik qualities that our minds ingest from the world around us. I had the pleasure of listening to a performance by the Iyer Brothers on the Veena in Melbourne last October. They played Rave Himagiri, a swarajati in Raga Todi composed by Shyama Shastri. 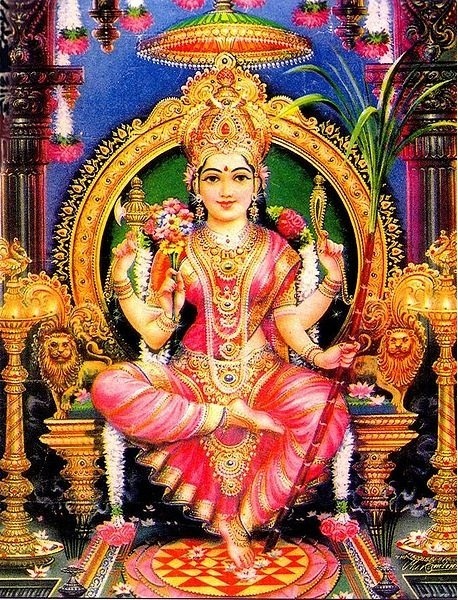 It is a prayer for blessings addressed to the Goddess Kamakshi. A truly wonderful composition, it is stately in pace, deep in tone, quiet in its quest. I never appreciated the full beauty of it until I listened to this performance by the Iyer Brothers. In the reverberating tones of the strings, the composition becomes the resonance of the universe, a pranava mantra in many syllables. A wonderful sattvik feast for your mind. I hope you love it as much as I do! For a vocal version, I feature a unique combination of voices – Semmangudi Srinivasa Iyer singing along with M.S.Subbulakshmi, two of the greatest musicians of the Carnatic world. Note: I do not speak Telugu. The lyrics from multiple internet sources were verified / corrected by listening to many renditions by different artists. The translation is sourced from the web. 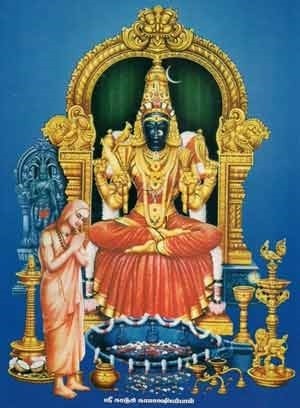 O Kamakshi of Kanchi! O daughter of the snow clad mountains! O bestower of boons! Please come! O mother mine! Listen to my prayers and grant me welfare! Protector of all those who bow to you! I believe in you only to protect me always. O destroyer of the arrogant demon Mahisha! Please dispel my agony. O protector of Cupid! You are my sole refuge. I praise you and beseech you (to protect me). There is no equal to you in all the worlds. Listen to my entreaties. O lotus-faced one with a neck like a conch shell, thick dark hair, eyes like a deer, teeth like pearls, with a gait as majestic as an elephant! I always reflect upon you and meditate upon you ! O the one worshipped by Shyamakrishna (signature of the poet)! Quickly dispel my worries and bestow me with fearlessness. O auspicious one! 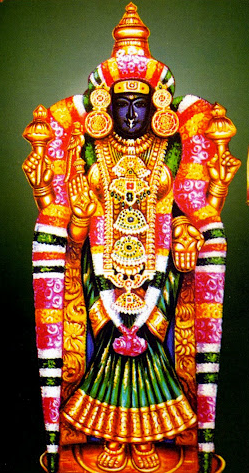 O Kamakshi of Kanchi! Your feet are my only refuge. Sri Yantra, shown on the left, is the most important of Hindu yantras or geometric devices used for meditation. This represents Shakti and Shiva, Creation and Destruction. One can meditate outwards, starting at the central bindu (dot) and slowly going outwards, meditating on the creation process, from simplicity to complexity, from unity to diversity. Or one can meditate inwards, meditating on the destruction process, eliminating complexity one by one until you arrive at the central bindu. There is, of course, symbolism involved in each of its component parts, which this site explains. There is great mathematical interest in the Sri Yantra as it is quite complicated to construct, especially the forms with spherical triangles. Correctly drawn, all the intersections should be correct and vertices of the large triangles should fall on the enclosing circle. This needs an advanced understanding of mathematics which the Hindus did not have at the time when it was first seen in the Atharva Veda (12 BC?). There are other points of interest. When correctly constructed, the base angle of largest triangles is the same as that of the Great Pyramid of Giza built in 2600 BC. From its proportions, one can derive Pi (π) and Phi (φ), the Golden Ratio. This research paper describes the complexities for mathematically inclined readers (quite beyond me!!). 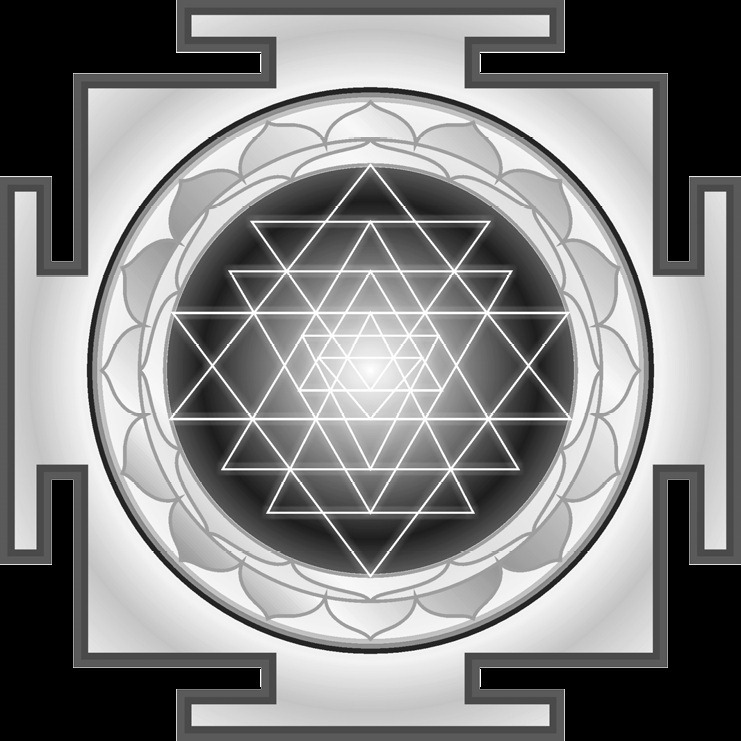 For practically minded people, this site shows how to construct this Yantra. One interesting story (I don’t know if it is indeed fact) is that when Dr.Hans Jenny, Swiss researcher in Cymatics (study of relationship between sound and form) used a Tonoscope to record the ‘form’ of the sound Om, it produced a perfect Sri Yantra! What has the Sri Yantra to do with my music blog? There is a researcher who says that Ragas and Raginis can be derived from the proportions of the geometrical elements of the Sri Yantra. But what triggered me to write of this Yantra today is that the song I have chosen is in praise of Lalita, Tripura Sundari whose symbolic representation is the Sri Yantra. Just as this yantra can be used as a focus for meditation, Mayamma written by Shyama Shastri (1762-1827) in Raga Ahiri can ease you into a tranquil state. A song in Telugu, it is sung in vilambit kaal (slow pace). The raga creates a devotional mood and a stilling of the mind. To know a bit more about the raga, click here. Dharma means not only religion, but also duty, virtue, custom, law, decree, righteousness, customary observance etc. ‘Leave every dharma’, Krishna says ‘and surrender only to me, I will deliver you from all sins, do not worry’. It is this sense of surrender that rings loud and clear in this beautiful song. To listen to a beautiful version of this song by T.M.Krishna, click here. When I call out to you as ‘Mother’, will you not respond to me? Is this fair mother Meenakshi? Who else is my sanctuary but you? O lovely one, extolled by Brahma who resides on a lotus, Vishnu and Maheshwara. I steadfastly trust only your lotus like feet, I affirm (by repeating). Please show mercy O Katyayani, O Kalika, O Bhavaani, O Supreme Goddess. O Queen of Sundaresha (Lord Shiva of Madurai), O Balamba with the sweet speech. O Mother, you dispel the sins of your worshippers. Your dark tresses are like rainclouds. O destroyer of demons! O lotus-eyed one! O Moon-faced (=beautiful)! O giver of boons! I constantly pray to you, o Golden One! Please grant me refuge. O granter of boons, are you not very generous? O Ambika! Don’t you have abundant compassion for your child? You are the protector of the whole universe. You are called the protector of destitutes. O sister of the celebrated dark-skinned Krishna. O courageous Shakti, Tripura Sundari.